The church of Saint Peter in Chains of Ménestérol was built in the XII century in Romanesque style. The western front with portal remains from this period. The interior was rebuilt in the fifteenth century. Two side chapels were added in the seventeenth century. 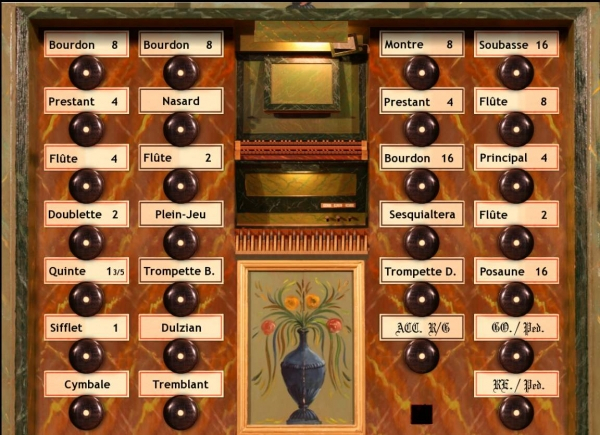 In the 1970’s, the organist Francis Chapelet was looking for a concert instrument for the church. 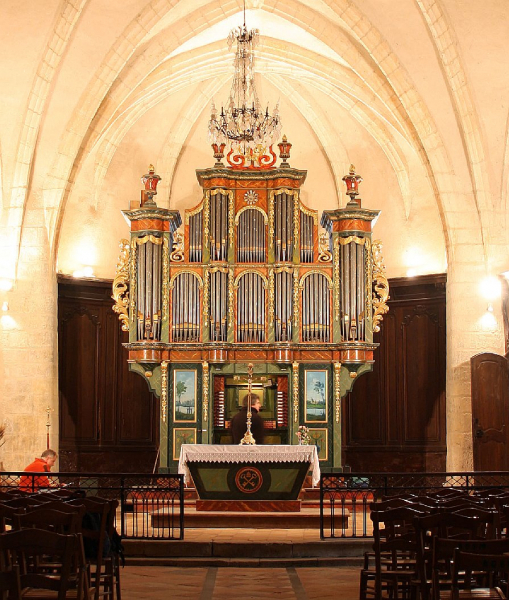 He used the remains of the organ of the Temple St Mathieu de Colmar which had been stored in a dismantled state after a fire. These remains included the case of the organ, the windchest of the Grande Orgue, some mechanical elements and the front pipes. 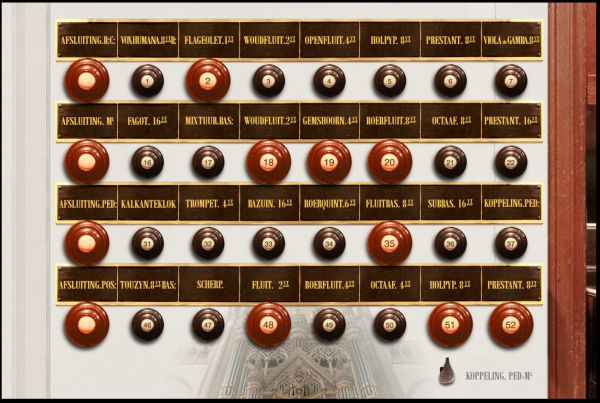 The 23-stop Colmar instrument, which had come close to destruction, had been built by ValentinRinckenbach in 1842 for the chapel of the old hospital which then became the Temple of St. Mathieu. After restoring, assembling and decorating the case in the choir of Saint Peter, a new instrument was added by Gerhard Grenzing between 1980 and 1982. 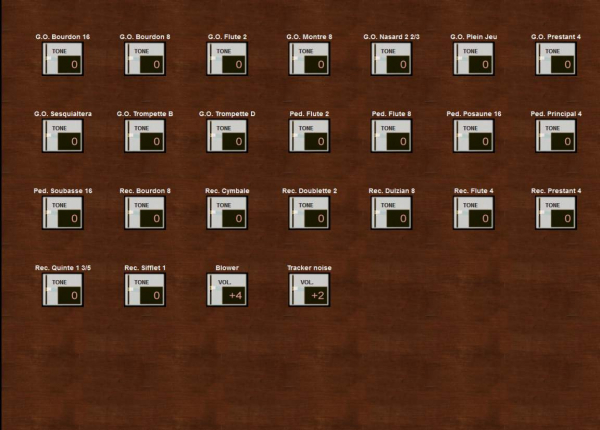 This consisted of two manuals (Hauptwerk, Oberwerk) and Pedal, with 23 speaking stops in all. In 2006, J. F. Dupont carried out a major overhaul of the organ, adding a Dolzian 8' in place of the small Regal of the Récit. 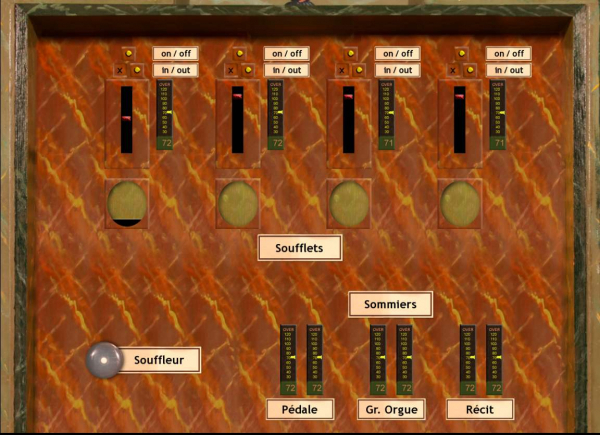 The organ is built in the style of the North German Baroque, on the model of the smaller Schnitger-type instruments which may be found for example in Grasberg, Pellworm, Noordbroek or Uithuizen. Hauptwerk v.4 and higher supported. The samples are offered in 24bit/48kHz quality; multiple releases (2-3 levels) and occasional multiple attack samples are used. The reverberation time is about2-3 seconds. No sampled tremulants. Minimal voicing and pipe speech corrections. Part of the post-processing was done using automated processing without human intervention. The sample set is presented in numerous variants listed below. The ambiental recording using the surround technique. The front ranks are AB recorded (spaced omnis), and the front ranks can be used for emulating the standard "wet" sample set (by muting the rear ranks). The wet portion of the sample set, loaded in 16-bit, is suitable for the Hauptwerk Basic. The recording was done near the organ case. The samples still contain some reverberation of the church, although the direct sound of pipes prevails. It is approximately the recording of the position of the organist. While the totally dry samples may sound rough when used without any additional reverberation, this "moist" variant of the sample set may be preferred by those who like dryer acoustics for home practicing. It may sound quite natural in the home ambience. 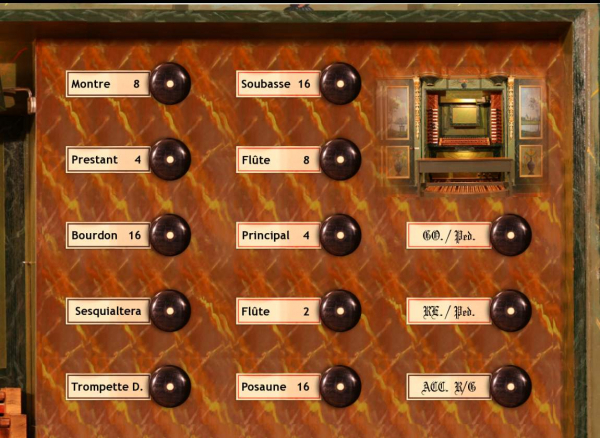 The recording was done inside the organ case. The samples contain almost exclusively the dry sound of the pipes. However, since we conserved the release tails in the full length (no fade-out), there are still traces of reverberation adding some natural ambience to the result. The organ is presented with original compass. Two manuals with 54 keys, a pedal of 30 keys. The temperament is equal. less strong tremulants on many stops which is perhaps giving better result. Anton Heger supplied two additional ODFs using the Menesterol sample material. He used the Moist and the Surround samples to form a Moist-Surround ODF. The front ranks are from the Moist samples, the rear are from the Surround. I like very much this new perspective of the organ! The second Dry-Surround ODF is similar, but the front ranks are formed by the Dry samples. It is also interesting perspective of the instrument, although you are likely to experiment with the ballance of the front-rear to achieve nice blend of the acoustic. Thank you, Anton! One user reported that Soubasse 16, the lowest D (038-D) has too quiet long reverb tail. Not confirmed.